In Capua, 75 B.C., the relationship between Crixus and Barca is becoming unbearable. That morning, Barca's lover has been killed by Crixus during a tough fight in the arena. Crixus is a tough guy, but he has a sense of companionship, so he wants to make peace with Barca. 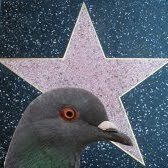 In the scene, Barca is alone and his only company is the pigeon which he raises. This is not the only example of fighters with feathered pets. Just try to Google Mike Tyson + dove. Returning to the episode, Crixus asks himself: What is the best strategy to make peace with the beast of Barca? Very simple: to try to be the friend of his favorite pet. Consequently, Crixus goes to talk with Barca and offers him a piece of bread for his pigeon. Cool, right? The first scene is interesting: we can see a pigeon that is the protagonist for 3 seconds. Crixus comes in but -because of the pigeon protagonism- he is completely blurred. Then we can see Barca, who is initially staring at his pigeon, and then, he faces Crixus -with a highly constrained rage.Thanks to the pigeon, the peace and friendship between two gladiators is reestablished. Pigeon activity: resting in the gladiator's hands. 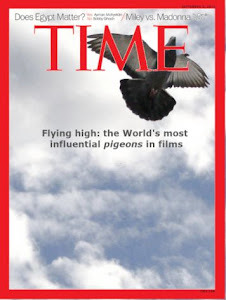 Symbolism: My hypothesis is that the pigeon has a crucial role in the scene, as it represents a catalyst that prevents the clash of these two characters. Relevance: In a cruel Roman world, a tough gladiator (Barca) uses pigeons to get some peace. Perhaps during that morning, he bravely killed several men during a killing rampage, but in the afternoon he takes care of his beloved creatures. In this character the pigeon transmits peace and calm, which is efficiently exploited by Crixus to make peace. What if Barca had been training with a sword instead of stroking a pigeon? Probably they would fight to the death, completely changing the course of this tv series. Training level: very high. This is a domestic pigeon explicitly used during the movie recording. I am in love with this site! Game of thrones: is Daddy a pigeon now?